The Regional Transport Office (RTO), Nashik, recently conducted a meeting with vehicle dealers to review the preparations being undertaken by the latter to sell vehicles equipped with HSRP. Nashik: Come April 1, all vehicles sold will have pre-fitted high security registration plates (HSRP). The move has been introduced by the ministry of road transport and highways (MoRTH) to crack down on vehicle thefts and enable easy tracking of lost and stolen vehicles. The HSRPs will come with a third registration mark and a chromium-based sticker which will have the details of the registering authority, registration number, laser-branded permanent number, engine number and chassis number. The sticker will be such that it will get destroyed once it is taken out, thereby preventing tampering or foul play. The HSRPs, including the third registration mark, will be supplied by the vehicle manufacturers to their dealers, who in turn would place the registration mark on the plates and affix them on the vehicle. Regional Transport officer Bharat Kalaskar guided the dealers about the essential things they will have to keep in mind while selling vehicles with the pre-fitted HSRPs. Deputy regional transport officer Vinay Ahire, ARTOs Pallavi Kothavade and Rahul Kadam also guided the dealers. 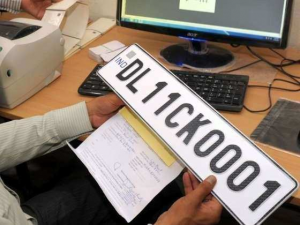 RTO officials said that they collected a fine of Rs 3 lakh only from vehicle owners for putting up fancy numbers on the registration plate till February this year. The officials said that the new plates would also bring down the rate of vehicle theft. In Nashik alone, over 400 vehicles are reported stolen every year. Officials said that all motor vehicles, irrespective of cars, bikes, trucks, etc would have HSRP.